If your child isn't really into fiction yet, it might be that he (yes, I'm using that pronoun deliberately because in my experience this so often applies to boys) will find non-fiction books appealing. If that's the case, I have a great suggestion for you! Hoosh! 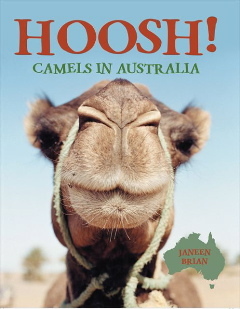 Camels in Australia was written by Janeen Brian and published by ABC Books (2005). The author also supplied all photographic and visual material. Hoosh! is not only an intriguing glimpse into Australia's history, it provides stacks of interesting facts too. Did you know that camels are used for weed eradication? How about camels spitting, myth or truth? What does a new-born camel calf look like? Do camels eat meat? Or tents? Or even baked beans? What's a cameleer? Like all great non-fiction books, Hoosh! Camels in Australia is studded with lots of intriguing photographs, text boxes and other snippets to marvel over. There are also teacher activity notes to support the book on Janeen Brian's website. This truly is an amazing book. The amount of research Brian must have done, the primary sources she plumbed and the people she interviewed must have taken months, years of work. What impresses me most though is the way she has taken all that raw material and turned it into entertaining, readable text. I loved it! I planned to dip into it over the course of a few days, but ended up reading it cover to cover in one sitting. Who knew camels could be so interesting? Hoosh! Camels in Australia is a must-have resource for schools. I can see non-fiction lovers grabbing it off library shelves (my copy is a robust, colour printed hardback book, but it's also available in paperback) and teachers will want it to support units on Australia or animals. While under 7's will enjoy all the pictures, I believe the text is aimed more at children over 10, both in style and content. If you have a youngster who loves books about "real things", then grab Hoosh! not just for him, but as an entertaining and fascinating read for the whole family. We're big fans of Hoosh! too. I loved the old photos of the first camels arriving in Australia, being hoisted off the ship. So many great photos - and I think the one on the cover is perfect!